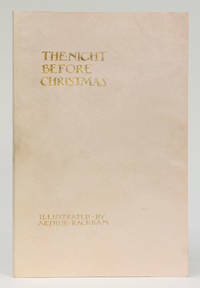 "A Visit from St. Nicholas", also known as "The Night Before Christmas" and "'Twas the Night Before Christmas" from its first line, is a poem first published anonymously in 1823. This famous poem helped to cement the image of Santa Claus from the description of his appearance, his transportation, and how he brings the gifts to children on Christmas eve. London: George G. Harrap and Co. Ltd. 1931. First edition with these illustrations. First edition with these illustrations. Deluxe issue, signed by the artist. Publisher's full limp vellum with titles in gilt to the upper cover. Illustrated with a colour frontispiece, 3 further colour plates and 17 black and white drawings throughout the text by Arthur Rackham. A superb fine copy, the vellum clean and the gilt bright. Complete with the rubbed original slipcase which has the hand numbered title label present as issued, remains firm and without repair or tears. An excellent example of this beautifully illustrated Christmas Gift Book. Limited to 275 copies for the United Kingdom of which this is hand numbered 249 and signed in black ink by Arthur Rackham to the limitation page. (Latimore & Haskell p.66; Riall p.174). Further details and images for any of the items listed are available on request. Lucius Books welcomes direct contact with our customers. London: George C. Harrap & Co., 1931. Original Rackham designed paper boards in red, green, and blue on ivory background. Faint soiling here and there on d.j. which carries the same design. Spine faintly sunned, and at bottom has a small injury with no loss of paper. The same incident shows on the book in the same location. Endpapers are Rackham silhouette design in red on ivory. There are four (4) full page color plates, and each page is decorated in delicate black and white, with each stanza having an initial red letter. If you want one Rackham book in your collection, this one is an elegant production.. First Thus. Paper Covered Boards. Very Good/Good. Illus. by Arthur Rackham. 8vo. Trade. 1988-03-02. New. Ships with Tracking Number! INTERNATIONAL WORLDWIDE Shipping available. Buy with confidence, excellent customer service! MOORE, Clement C. (RACKHAM, Arthur) THE NIGHT BEFORE CHRISTMAS. Philadelphia: J.B. Lippencott & Co., (circa 1931). 8vo. Cloth boards with Printed decorated front panel. (36) pages, plus 4 colored plates. First American edition, first issue. [Marshall, Night Before Christmas, # 298]. Rare edition. OCLC records three Philadelphia editions of later dates, but none dated so early. A colorful interpretation of Moore's classic Christmas poem illustrated by this foremost English artist of the Edwardian era - a masterful combination of whimsy and fantasy - have been used in countless reproductions including miniature books marketed as tree ornaments. Arthur Rackham illustrated this American classic towards the end of his life, and it is interesting to note that the elderly figure of the father is thought to be a self-portrait. His illustrations include a colored frontispiece and three colored text plates and many black-and-white text drawings. With personal inscription on front blank leaf dated "Christmas 1931." Very good. London: George C. Harrap & Co, 1931. First Rackham edition. Softcover. Lovely "True to the End" bookplate on front pastedown and light browning and wear, otherwise near fine in original illustrated pictorial wrappers and near fine pictorial dust jacket.. Thin octavo. 36 pages. Fully illustrated with black-and-white vignettes and color plates by Arthur Rackham. 1977-09-30. Good. Ships with Tracking Number! INTERNATIONAL WORLDWIDE Shipping available. May not contain Access Codes or Supplements. May be ex-library. Shipping & Handling by region. Buy with confidence, excellent customer service! 1981-02-02. New. Ships with Tracking Number! INTERNATIONAL WORLDWIDE Shipping available. Buy with confidence, excellent customer service! 1996-08-01. New. Ships with Tracking Number! INTERNATIONAL WORLDWIDE Shipping available. Buy with confidence, excellent customer service! 1985-09-05. New. Ships with Tracking Number! INTERNATIONAL WORLDWIDE Shipping available. Buy with confidence, excellent customer service! 2000-04-06. New. Ships with Tracking Number! INTERNATIONAL WORLDWIDE Shipping available. Buy with confidence, excellent customer service! MOORE, Clement C. (RACKHAM, Arthur) THE NIGHT BEFORE CHRISTMAS. London: George C. Harrap & Co., (1939). 8vo. Printed decorated color wrappers. Color plate frontispiece, (32) pages. [Marshall, Night Before Christmas, # 344]. A colorful interpretation of Moore's classic Christmas poem. The illustrations are by Arthur Rackham the foremost English artist of the Edwardian era - a masterful combination of whimsy and fantasy - have been used in countless reproductions including miniature books marketed as tree ornaments. Rackham illustrated some of the most famous books of the first half of the 20th century, this pamphlet being one of his last works. His illustrations include a colored frontispiece plate and many black-and-white text drawings. It is interesting to note that the elderly figure of the father is thought to be a self-portrait. Very good. Tarrytown: Marshall Cavendish, 2006. 1st ed.. Hardcover. As New. Spirin, Gennady. 1st ed., No. 38 of 300 signed and numbered copies, 4to picture book full green leatherette stamped in gilt, illustrated in lavish color by Gennady Spirin and signed and numbered by him on a vellum limitation page bound in before the half-title page, in red silk clamshell case with color cover plate. As new in original shipping box. Signed by Spirin. Stevens Publishing LLLP, Gareth, 1985. Hardcover. Good. Disclaimer:A copy that has been read, but remains in clean condition. All pages are intact, and the cover is intact. The spine may show signs of wear. Pages can include limited notes and highlighting, and the copy can include previous owner inscriptions. Toronto: Clarke Irwin & Company Limited, 1931. No date, c. 1931. No dust jacket. Light red paper boards with black lettering, fade to spine and very light wear to tips of boards. Clean througout, illustrated with plates by Arthur Rackham. Canadian Edition after the UK sheets. . Hardcover. Very Good. Illus. by Arthur Rackham. 1998-05-02. New. Ships with Tracking Number! INTERNATIONAL WORLDWIDE Shipping available. Buy with confidence, excellent customer service! Norwalk, Connecticut: The Easton Press. 2002. Hardcover. Hardcover. 2002. Easton Press Leatherbound. Two small bumps to top of front cover, else Dark Green Leather Binding in FINE condition. Gold gilt lettering on spine. Gold gilt design on front and rear covers. Hubbed spine. All page edges in gilt. Bound in ribbon marker and silk moire endpapers. ; Square 4to 9" - 11" tall . Philadelphia:: John C. Winston Co. ,, 1883.. Hardcover. Poor. Unpaginated, 12mo. Quarter-cloth hardcover. Illustrated (w/ b&w etchings) by William T. Smedley, Frederic B. Schell, Alfred Fredericks, & Henry R. Poore. Moderate discoloration, soiling (including pen markings) & edgewear to boards. Heavy wear w/ tears to spine & some pieces chipped off; binding loose but holding (handle gently). Soiling, pencil writing & scribbling to pds & eps. Separations, moderate soiling, brown spots, creases & tears throughout textblock. London: George G. Harrap & Co. Ltd., 1939. Stated at copyright: This Edition First Published 1939; an early original printing. Unique folded pictorial wrapper with protective flaps at front and back, moderate edge wear, rub. Pages very good; brief antiquarian inscription at front blank endpaper. Frontispiece color plate of an elf returning up the chimney while father looks on with candle. Illustration with Rackham's stylish imagery and whimsical imps throughout. The father of the family narrates the words just as Clement Moore wrote them, and artist Arthur Rackham captures the spirit in vibrant illustrations that reflect this memorable night. Visually he extends this favorite Christmas story for children, who will delight in watching the two mischievous stowaways from the North Pole enthusiastically exploring the sacks of gifts on the roof while St. Nick, unaware, journeys down the chimney... until the toys spill down onto the lawn and he turns with a jerk! Who's that peeking out of the sleigh? As St. Nick and reindeer descend through a brilliant night sky onto the roof of a Victorian house in a snowy New England village, the famous Christmas poem begins. A unique and beautiful edition to be cherished for years to come by all the family, especially the youngest, who find the night before Christmas perhaps the most exciting night of the year. A beautifully imagined holiday classic! Made in Great Britain. Printed by Jerrold & Sons, Ltd., Norwich. Insured post.. First Edition. Soft Cover. Good. Illus. by Rackham, Arthur. 8vo - over 7¾ - 9¾" Tall. New York: E.P. Dutton, & Co., 1928. Hardcover. Orig. white color illustrated paper covered boards, black cloth spine. Very good, in good dust wrapper. Unpaginated (15 pgs.) 28 x 20 cm. A Christmas time favorite including "Noteworthy twelve reindeer pulling the sleigh across a two-page spread." [Marshal 278]. A very clean and handsome copy with no prior ownership markings. Dust wrapper rubbed and chipped with 3 cm. loss to tail of spine. 1990-05-02. Good. Ships with Tracking Number! INTERNATIONAL WORLDWIDE Shipping available. May not contain Access Codes or Supplements. May be ex-library. Shipping & Handling by region. Buy with confidence, excellent customer service!